I was browsing the internet looking at recipes yesterday and found this one for a White Bean and Mushroom Ragout from Whole Foods. There is SO much to like about this recipe! I know – but first of all – what the heck is a Ragout? Well it may sound fancy (pronounced Ragú- like the sauce) but it simply means a thick stew typically made from seasoned meat and vegetables. And it does just that! I made a few alterations to the original recipe and WOW. White Cannelini Beans: which are very low in calories and fat, and very high in Protein and Fiber. 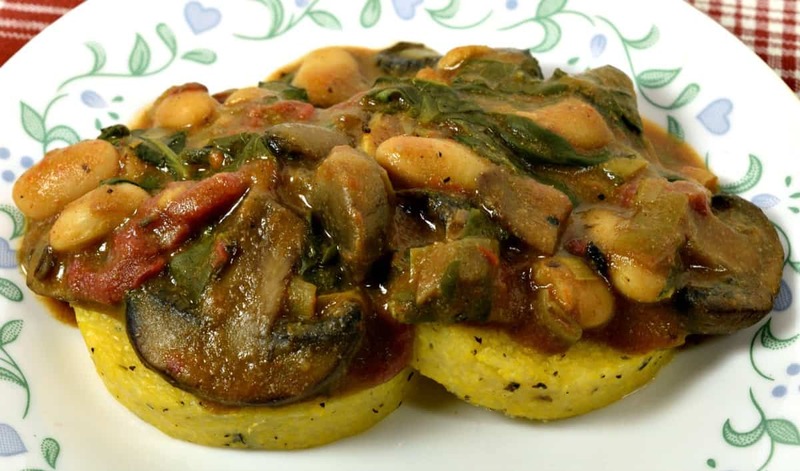 Mushrooms: which are also Fat free, Cholesterol Free, and high in Selenium, Potassium (8% RDA), Riboflavin, Niacin, and Vitamin D.
In other words – this White Bean and Mushroom Ragout is SUPER healthy! 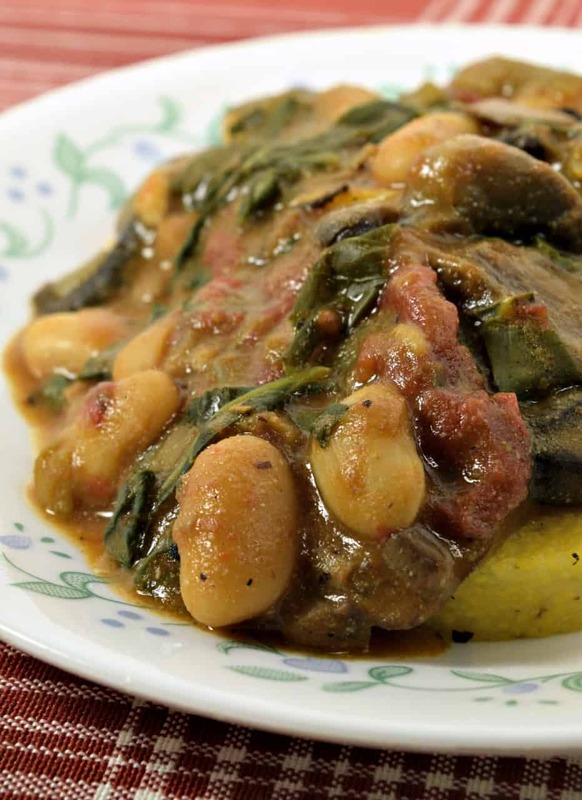 And when you serve it over a healthy starch like rice, pasta, potatoes, or in my case Baked Polenta? Pssssh – forget about it. It’s super easy to make, a one pot meal, and uses everyday ingredients probably already in your pantry. So what do you say? Read to eat healthy? In a large stew pot start simmering 3/4 cup of low sodium Vegetable Broth. Add 2 diced leeks (or one diced sweet onion) and 4 cloves of minced garlic and let that simmer for about 5 minutes. Add 1 tsp of dried Thyme, 1/2 tsp of dried Rosemary, and 1/2 cup of any Red Wine. The wine really adds a lot of flavor so shouldn’t be skipped. Don’t worry, we’re going to reduce it quite a bit so there won’t be any alcohol left. Let that simmer until the liquid has reduced by about half. Now add 16oz of fresh mushrooms (2 8oz packages – I used white button and baby bella). Cover the pot and let the mushrooms simmer until they have released their liquid and have shrunk in size, stirring occasionally. Add an additional 1 ½ cups of vegetable broth and a 15oz can of Fire Roasted Tomatoes, increase the heat to med high, and stir to combine. Now in a small bowl whisk together 2 Tbls of Whole Wheat Flour and 4 Tbls of Nutritional Yeast. Add 2 tsp of low sodium Tamari (or Soy Sauce) and 4 Tbls of Vegetable Broth to make a thick slurry and stir this in. This will help thicken the stew. Let that simmer until it thickens. If it still seems watery after 5-10 min or so, sprinkle on an additional tablespoon of whole wheat flour (in my case I used Masa Harina which is a Tamale Flour) and whisk that in. It should look like a nice, thick stew, not a soup. Drain and rinse a 15oz can of Cannelini Beans and stir those in. For the greens I used one of those plastic cartons of Baby Kale you see in the salad section of your grocery store. It was a 5oz package and I used about half. I rinsed the leaves, sliced off any stems, and cut the leaves into slivers before I added them into the stew. They’ll wilt pretty quickly. Finally, stir in 2 Tbls of Balsamic Vinegar and 10 sliced cherry tomatoes. Let that finish simmering for a few minutes, season with salt and pepper if desired, and serve. I served mine over sliced Polenta (those tubes of cooked corn meal you see in the grocery). Look for fat-free and organic. Simply slice the Polenta into 12 even slices (about 1/2″ thick) and bake on a parchment lined cookie sheet until firm. Thank you Whole Foods for the inspiration. So many naysayers about our WOE think we deprive ourselves because we don’t eat meat, dairy, or junk foods. Let liquid reduce to about half. Mmm, this looks so good. I’ve never had polenta, but I’d love to make my own.